There are six shades in the collection ranging from some red and purple tones right through to darkest grey and brown. They remind me of gloomy autumn days, but in a good way, as each shade has a twist of grey almost like it's being followed around by a rain cloud - which is of course completely likely at this time of year! Haute Hoodie - to me this shade is like a distressed lilac and it's the perfect way to wear your pinky-purple tones for autumn. A really grey-toned mauve, it's very easy to apply and wear and it's one of my favourites from the new collection. Luscious Leather - I get a little tired with the overload of berry shades around at autumn, so I'm pleased to see a real twist on that look with this shade - it's a grey-toned berry, the name 'dirty raspberry' pops into my head when I look at this shade... 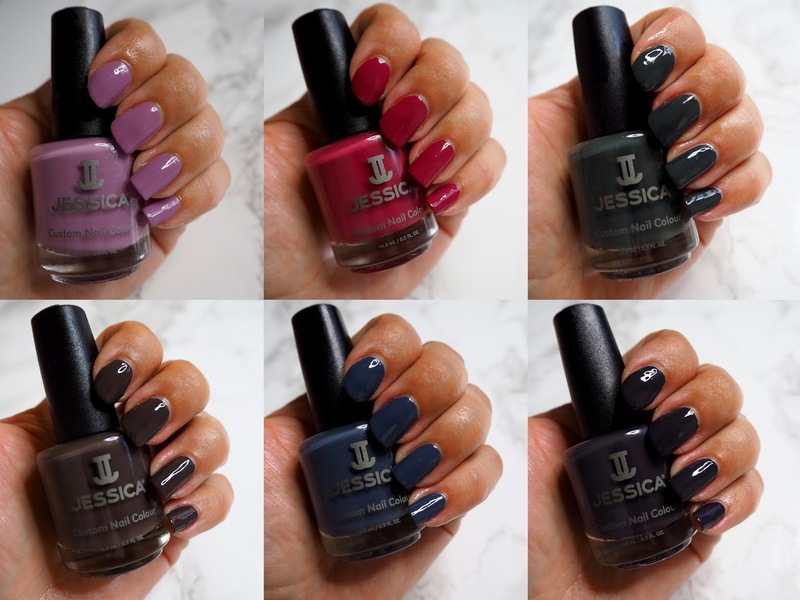 I guess Jessica aren't going to offer me a job naming their new polishes any time soon! On the Fringe - I really like dark green nail colours. I wouldn't really touch a green brighter than this, but there's something about shades of forest and British racing green that I find really chic. On the Fringe is one of those forest shades mixed in with grey, and I really love the result. Fab Faux Fur - onto the autumnal brown shade of the collection - a really dark, cool shade again, it's a deep taupe mixed with grey - a dark greige perhaps - and it's very sophisticated colour which benefits so much from the super shiny top coat. Deliciously Distressed - this one's a deep denim shade of blue mixed with grey - very cool toned and flattering on my skin tone. This is one of my surprise favourites as it didn't really grab my attention so much in the bottle, but I really liked it once I'd applied it. Very Vinyl - as you'll have noticed by now, this is a really grey-based collection, so it's no surprise to find a true grey amongst the polishes. This one is deep, dark and glossy - even darker on the nails than in the bottle and it looks super classy on the nails. 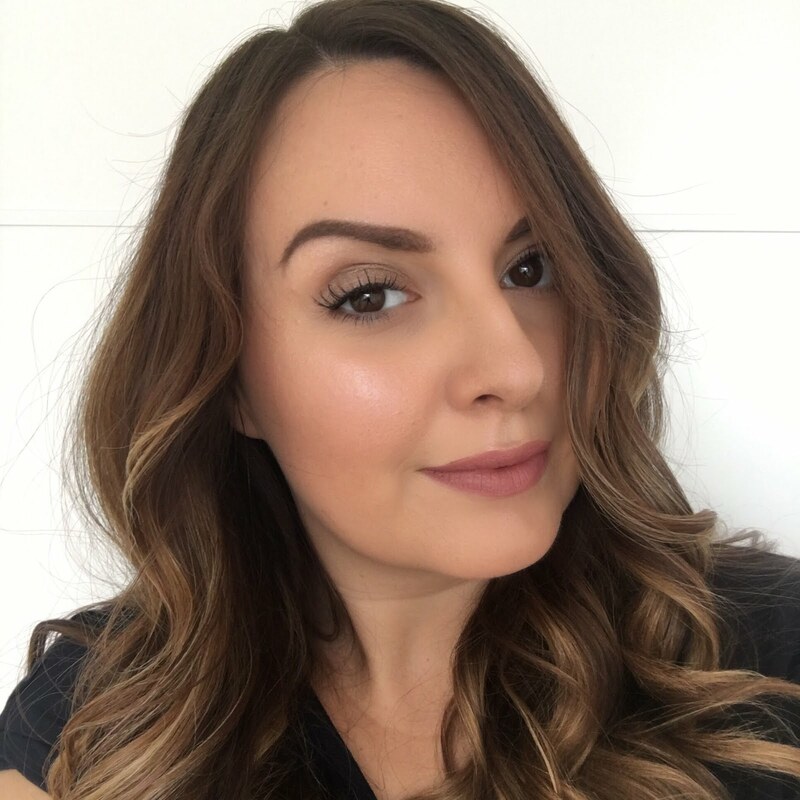 All of the shades have excellent coverage and apply really smoothly with a creamy, shiny result. I applied two coats of each colour. As with most polishes, I did get some small chips on a couple of nails by day two, but I'm very heavy-handed with typing and what not so this is completely normal wear time for me. 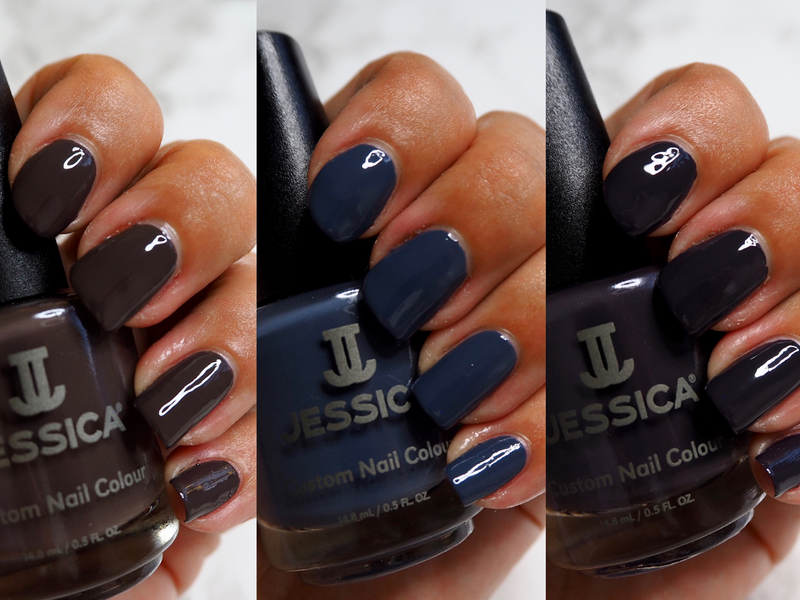 I've also been trying out the ever so shiny Jessica Thick Plumping Top Coat with these polishes. It's designed to give a volumised, gel-like finish. It's super, super shiny and it does make my nails look kind of plumped up in the way you'd expect from a gel. The extra shine compliments the shades in the collection so well too. Personally, although I love the shine, I've found that it doesn't seem to last that well on me and after a day the shine has dulled down. The solution to this is to reapply the topcoat if you want to keep that super high shine look, which also helps to keep the chips away, but I guess it does mean you might get through the bottle a little more quickly. 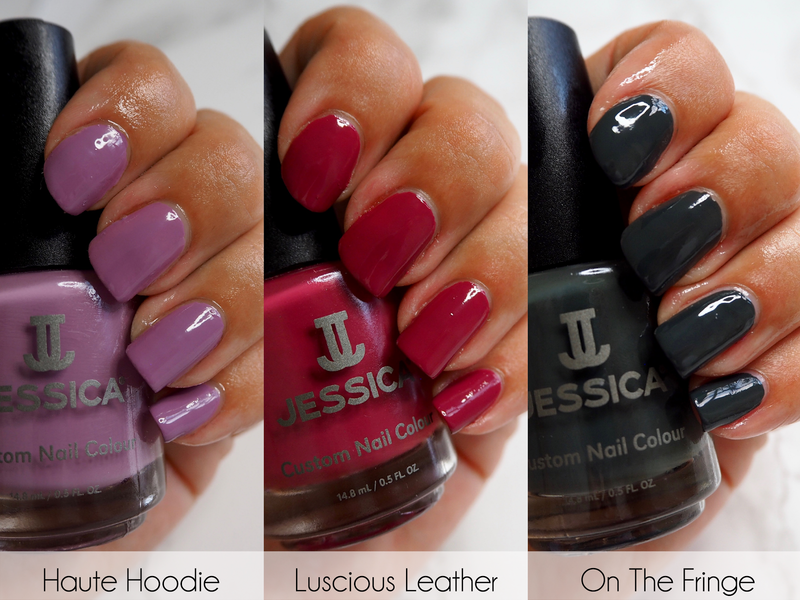 The Jessica Street Style collection is available now at jessicacosmetics.co.uk and the full size polishes are £11 each.